Property 8: Puerto Escondido's Best Condo! Tasteful Casita on a Quiet Street Near Beaches with Views! Property 11: Tasteful Casita on a Quiet Street Near Beaches with Views! 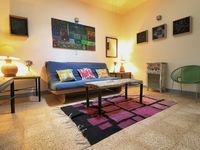 Is in a great location! Go to everywhere! We are Pet-friendly! Property 12: Is in a great location! Go to everywhere! We are Pet-friendly! Apartments one block from Zicatela Beach! Property 17: Apartments one block from Zicatela Beach! Acogedora palapa privada cerca de la playa. Property 25: Acogedora palapa privada cerca de la playa. Oceanfront apartments located on the famous Zicatela surfing beach. Property 31: Oceanfront apartments located on the famous Zicatela surfing beach. Cozy, clean house with everything you need. 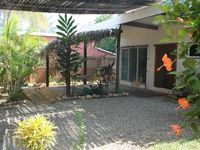 The property has a covered porch and drive surrounded by many species of tropical trees, plants, and flowering shrubs. There are banana plants, three types of Frangipani trees, parlor palms, cabbage palms, and three kinds of hibiscus. The porch features a hammock, table and chairs, and other furniture. The kitchen has everything you need for home-cooked meals. This is great if you don&rsquo;t want to visit the many nearby restaurants and when you get a great deal on red snapper, caught that morning and on your plate at night. I easily cooked full meals, many times in six weeks, for my wife and me. A hundred yards away, right around the corner is the three mile long Zicatela Beach and the majestic Pacific Ocean. The housekeeper keeps the place crystal clean. This casa is a cool refuge when the hot sun beats down. We filled the fridge with our favorite foods and beverages so when it is siesta time we can relax and take advantage of it. A little slice of paradise!!! Perfect size home for two couples or family of 5. Kitchen had everything we needed. Beautiful breezes come through the house and porch, you can relax and hear the birds...Great location for beach and restaurants!!! Roberto was attentive to anything we needed and we would definitely rent with him again. Can&rsquo;t wait to return! !